Jim Sinopoli, Principal, Sinopoli and Associates, and author of the book "Smart Buildings"
To read more about the handbook read the release. Smart buildings offer facility managers a much greater set of tools to save money, energy and personnel. Sinclair: What are the market drivers of automated buildings? Sinopoli: The drivers continue to be technology, economics and functionality. On the technology front, a critical mass has been reached and surpassed and the technology is readily available – this is unlike the “visionary” talk of 5-15 years ago when the technology was not available. The economics of smart buildings are resulting in lower capital costs, lower operating costs and potential revenue opportunities, all of which is music to the ears of owners, developers and facility managers. Finally, integrated systems are providing functionality that is unavailable with traditional systems – system capabilities such as sharing information and web access are truly ramping up the efficiency and effectiveness of the systems and the building’s operation. Sinclair: What are the obstacles to the current marketplace? Sinopoli: I think by far the largest obstacle is the legacy delivery method for the design and construction of buildings. Many times, both the design of and the construction and installation of systems within buildings are conducted in “silos’, where each system has a different designer and contractor – this is totally counter to the integrated approach. An example: the mechanical engineer designs the BAS system, the electrical engineer designs the lighting control system, the IT consultant designs the voice and data network, the security consultant designs the security systems, etc. How can one be successful using legacy methods to design and deliver state of the art technology? The answer is you can’t without great difficulty. Sinclair: How do we address these obstacles? What’s the best guidance you have for successfully designing and installing an automated building? 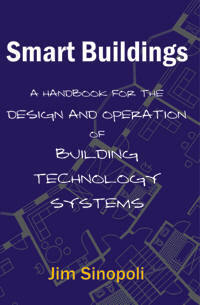 Sinclair: How do smart buildings affect those involved in information technology? Sinopoli: The dominance and the rapid penetration of Ethernet, TCP/IP and structured cabling into other technology systems means change for the IT department. Look at what’s happened over the last six years: six years ago, IT managers basically handled the data network; then telephones evolved to VoIP and the IT department got involved in telephones; then video surveillance systems turned to networked cameras and video servers and the IT department got involved. On the horizon are all the other building technology systems which have some level of TCP/IP, structured cabling and web access. Therefore the greatest impact of automated buildings on the IT department will be organizationally – that is, setting new boundaries for their responsibilities with facility management and life safety organizations, which may result in taking on new tasks and skill sets. Sinclair: How do smart buildings affect those involved in facility management? Sinopoli: Smart buildings offer facility managers a much greater set of tools to save money, energy and personnel. Much like IT the greatest impact of automated buildings on the Facility Management Departments will be organizationally – that is new required skill sets for personnel, changing work processes and of course establishing responsibilities and boundaries with the IT organization.